We are witnessing competing narratives of illness politics at work as Republicans attempt to repeal and replace the Affordable Care Act. What illness looks like and how we do illness politics is contested terrain. Consider recent protests on Capitol Hill against the GOP’s Better Care Reconciliation Act draft bill. 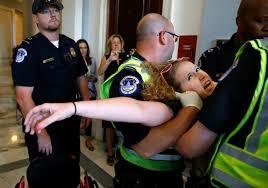 Led by disabled activists who are members of ADAPT, a disability rights organization known for its direct action tactics, the protests garnered mainstream and social media attention as images of police removing activists in wheelchairs from Senate Majority Leader Mitch McConnell’s office circulated widely. Other images showed police separating ADAPT activists from their wheelchairs to arrest them. Such images of the use of force against a vulnerable population helped drive home ADAPT’s message that this bill was a matter of life and death for some. As one sign proclaimed, “Medicaid is life” for many people with disabilities. Activists like Stephanie Woodward, Gregg Beratan, Anita Cameron, and Bruce Darling put their vulnerable bodies on the line in order to generate media coverage about what was at stake—in the most material terms—in the ongoing debates about healthcare in America. The protests on Capitol Hill were just one of many demonstrations organized by ADAPT in what they are calling a #SummerOfADAPT. 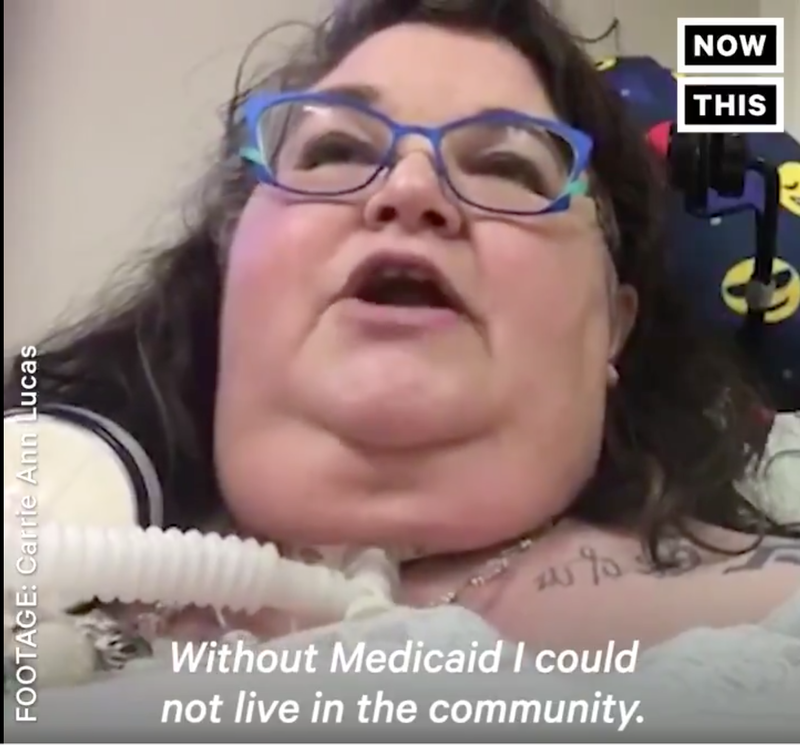 As Congress recessed for the 4th of July holiday, ADAPT activists across the country sought to communicate directly to GOP senators at their home offices about the devastating impact of Medicaid cuts. In Denver, activists conducted a sit-in at Senator Cory Gardner’s office for 58 hours in an attempt to tell the senator their concerns. Senator Gardner never met with the activists, and they were eventually arrested. Activist Carrie Ann Lucas was charged with trespassing and, because she refused to help police operate her motorized wheelchair, she was also charged with interference. Lucas’s noncooperation fits into a long history of nonviolent civil disobedience as an effective form of embodied resistance. In this case, her chair is not simply an instrument used by her body, but part of her body that went limp as the police tried to remove and arrest her. Carrie Ann Lucas: Without Medicaid I could not live in the community. ADAPT and its direct action political tactics are not new. Although many origin stories of this radical form of health activism start with the founding of the AIDS Coalition to Unleash Power (ACT UP) in New York City in 1987, ADAPT pre-dates ACT UP by at least a decade. While many have made direct links between ADAPT and ACT UP, taking a longer view of health activism suggests ACT UP is a link between earlier health activist movements, including those associated with the women’s liberation movement, Civil Rights groups like the Black Panther Party and the Young Lords, anti-psychiatry, and environmental justice. This longer view would also include the Independent Living Movement (ILM), which advocates for disabled people to live in their communities not in nursing homes or other institutions, to make decisions about their own lives and care, and in general articulates an everyday ethics of self-determination. The ILM was started by Ed Roberts in Berkeley in the early 1970s, but the movement quickly spread beyond Berkeley to other less counter-cultural milieus. The second Independent Living Center was the Atlantis Community founded by the Reverend Wade Blank in Denver in 1975. ADAPT emerged out of this local Denver disability activist environment that Atlantis cultivated and first garnered widespread media coverage in 1978 for protests calling for wheelchair-accessible public transportation. The ADAPT acronym initially stood for American Disabled for Accessible Public Transport. As the group broadened the political issues it engaged in, ADAPT maintained the acronym but adapted its meaning. Now ADAPT stands for American Disabled for Attendant Programs Today. The alternative meanings of the acronym reflect the importance of both freedom of movement in the public sphere and access to good care and assistance in both public and private spheres as necessary to enable full citizenship and participation for disabled people. Just two days after the dramatic protests on Capitol Hill, Vice President Mike Pence articulated an alternative version of illness politics, emphasizing personal responsibility and the market as keys to good health and healthcare. Pence gave his speech in Colorado Springs at the 40th anniversary celebration of the Christian multimedia organization Focus on the Family. Like ADAPT, Focus on the Family emerged in Colorado in the late 1970s, but rather than drawing inspiration and political tactics from the new social movements of the late 1960s and early 1970s, Focus on the Family offers an alternative conservative cultural politics that goes hand-in-hand with neoliberal economic policies seeking to privatize public services, policies that gained steam in the 1980s and are predecessors of many of today’s austerity measures. In this privatized and privatizing cultural politics, the family, not the community or state, is expected to care for its own, and women are expected to function as primary carers in families. In this context, Pence used illness as metaphor for individual and social weakness, and personal responsibility and free-market competition became the solution to problems of bodily, and by extension, moral weakness. The rhetoric of personal responsibility denies the fundamentally interdependent condition of society. It relies on a simplistic eugenics logic that suggests whole groups of people might be deemed unfit to participate and left to die. The ADAPT activists know much is at stake in this battle over healthcare. For these activists illness and disability are not metaphors. They are real material conditions of life that require creative responses at the level of both the individual and society. They challenge us to adapt—not simply our bodies and our selves, but our society—so that everyone can participate in political and social life to the fullest extent possible. What we are seeing in this #summerofADAPT is democracy in action around the question of what kind of society we want—one that would enable the many to flourish and live valuable lives, or one that protects and enables the few?